Mark's Tickets is the best place to find tickets for Oklahoma City Thunder fans. Just check this page for any new events or schedule updates throughout the year. We sell tickets to every Oklahoma City Thunder game around the world. 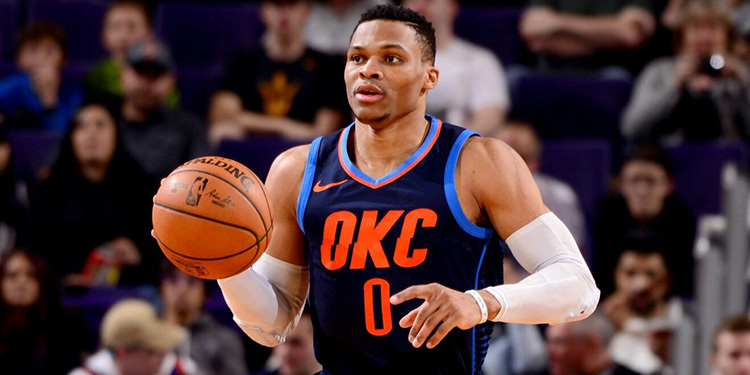 We know how passionate Oklahoma City Thunder fans can be about basketball, so we make sure to have hundreds of tickets for every game available right up until it starts. For those looking for cheap Oklahoma City Thunder tickets, we offer tickets starting at very low prices (many times below face value). We offer tickets in most sections of every venue that you can see Oklahoma City Thunder. Simply choose the city or venue that you are interested in below, and you will be able to see all of the available seats. Do not forget that Marks Tickets also specializes in sold out Oklahoma City Thunder tickets. No longer will sold out shows prevent you from seeing Oklahoma City Thunder. The Oklahoma City Thunder are a professional basketball team that plays in the NBA. The Thunder play their home games at Chesapeake Energy Arena in Oklahoma City, Oklahoma. With 82 games per year, and 41 being home games, The Oklahoma City Thunder are an American professional basketball franchise based in Oklahoma City, Oklahoma. They play in the Northwest Division of the Western Conference in the National Basketball Association (NBA); their home court is at Chesapeake Energy Arena. The Thunder's NBA Development League affiliate is the Tulsa 66ers, who are owned by the Thunder. The Thunder are the only team in the Major professional North American sports leagues located in the state of Oklahoma. Formerly the Seattle SuperSonics, the team relocated in 2008 after a dispute between owner Clay Bennett and lawmakers in Seattle, Washington. The SuperSonics qualified for the NBA Playoffs 22 times, won their division six times and won the 1979 NBA Championship. In Oklahoma City, the Thunder qualified for their first playoff berth during the 2009–10 season. They followed this success by winning their first division title as the Thunder in the 2010–11 season and their first Western Conference championship as the Thunder in the 2011–12 season, appearing in the NBA Finals for the fourth time in franchise history and first since 1996, when the club was based in Seattle. The team's rivals are the Dallas Mavericks, San Antonio Spurs, Houston Rockets and the Miami Heat.